Bishop of Durham the Right Revd Paul Butler is the Patron of Nepacs. 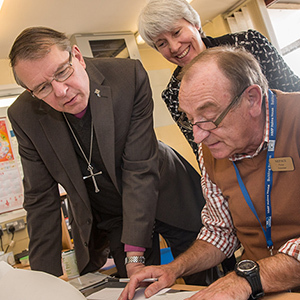 The Bishop follows in the footsteps of his two predecessors, who were also Patrons, and the organisation is close to his heart as he is the Church of England's national lead on Children, Young People and Families as well as safeguarding. "Visiting prison can be an uncertain time for families and Nepacs can help make the experience less daunting. I am proud to be Patron for Nepacs, whose committed team of volunteers are helping people through a difficult time in their lives and making a real difference." Nepacs chief executive Helen Attewell said that there was a long link between the Church and the organisation. She said Nepacs' work helped families, and particularly children, to cope with the imprisonment of a loved one. She said: "When a loved one goes to prison the impact on families and friends can be devastating, which is why our staff and volunteers provide friendship and support during this difficult time. We are all about making families feel supported and welcome, and it is important that we provide them with the information that they need. "We see ourselves as helping to maintain family ties, as it not only helps the families but can also help prisoners' resettlement and reduce reoffending. "We are delighted that the Bishop of Durham has agreed to be our Patron. The Church is an important part of the wider community and prisoners will be part of that wider community when they are released. We would welcome more volunteers with a faith background to come forward and support our work."